Day 3 is skin care. 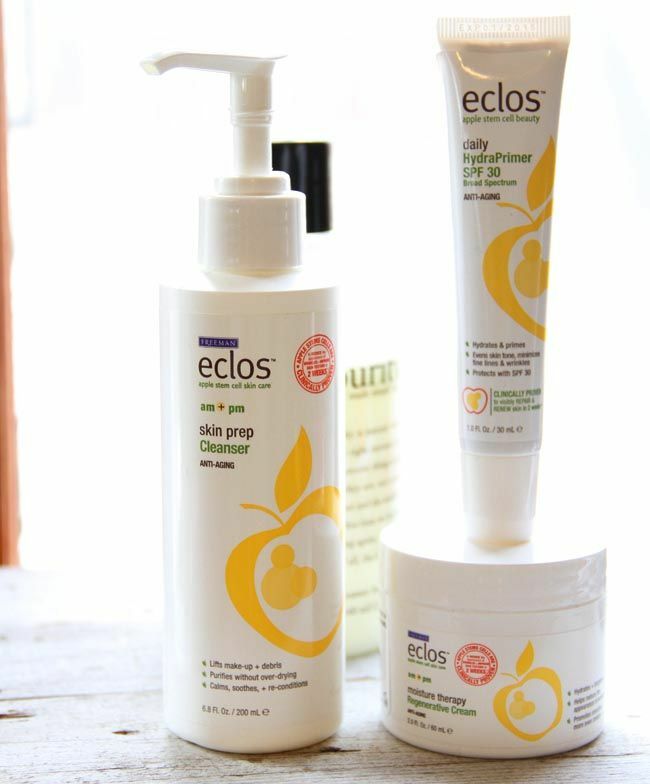 Through the power of the internet, over the summer I was sent full sized samples of Eclos skincare to try. My skin is not my greatest feature. I've never really had good skin. It's dry. I have a few wrinkles. Under eye circles, splotches, and age spots. I mean, it's not terrible. It could be much worse. But it's not great. I've tried numerous brands. Mary Kay, Arbonne, Clinique, drugstore brands, even Cetaphil, which is highly recommended by dermatologists. They've all been too drying. But Eclos came with big promises: Clinically proven to reduce appearance of wrinkles and improve texture in 2 weeks. I tried it, morning and night consistently for 2 weeks. And guess what? My skin looked amazing! Wrinkles weren't gone, but they were softened. Age spots didn't go away, but they faded. And best of all, my skin didn't itch or burn. Now since then, I've gone back to my normal lazy self and only wash once a day. But I still love it. I love that it does an amazing job of removing makeup. It has a very light faint citrus scent. Add a little water, suds up, even over the eyes (it doesn't burn them! ), then wash off with a wet washcloth. My backup is Purity by Philosophy. I love it too. But it's currently taken a back burner to Eclos. *not sponsored by Freeman Eclos. Mary Kays botanicals line the face wash and moisterizer for normal skin. I also use their new spinbrush thingy... its AMAZING!